“I thought the show was excellent,” said Carol Schefflin, fourth-grade teacher at Notre Dame Catholic Academy, Ridgewood, who attended one of the first performances in early December at the Immaculate Conception Center, Douglaston. “I thought the themes it dealt with were things that kids could relate to – friendship and fitting in,” she said. 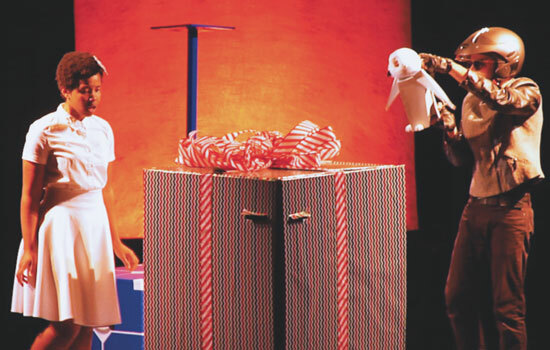 Presented by the nonprofit theatre company Stages on the Sound, “Robot 4 Christmas” is a sci-fi musical that captures the season’s spirit of love and amity, while touching upon some experiences young audience members may face in life. This is the 10th year Stages has produced a Christmas show exclusively for the Catholic schools in Brooklyn and Queens. More than 4,500 children from 41 schools were scheduled to see the play. Attendance was free for schools participating in Stages’ performing arts residency program. Performances began at the Immaculate Conception Center, Nov. 30, and ran through Dec. 11. The limited-engagement show will continue Dec. 14-18 Our Lady of Perpetual Help auditorium, Sunset Park, before wrapping up its run. Study guides and lesson plans were sent to participating schools for further class discussions following the performances. Over the course of about 45 minutes, five professionally trained actors present the story of a brilliant 12-year-old girl named Liv, played by South African-born actress Kineta Kunutu, who gets a mysterious present from the future: a robot whose mission is to help her form a friendship with a new boy at school named Chester. Liv and Chester both face challenges communicating with others, and these preteens feel very much alone until they find each other. 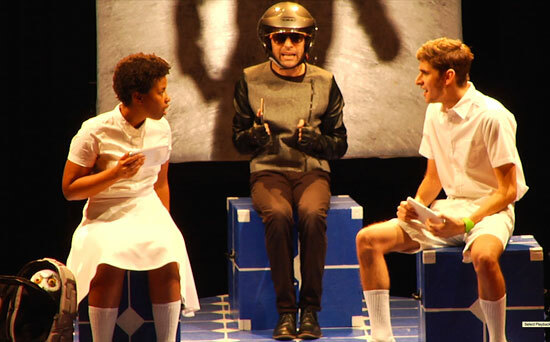 Liv, far left, and Chester, played by Stephen Amenta, far right, start to form a friendship despite having trouble communicating. “The story really becomes about how you make friends, how you learn to communicate with different people and how they (Liv and Chester) end up helping each other,” explained actor Stephan Amenta, who plays Chester. Aside from the main storyline, the play’s setting also raises questions for classroom discussion. The protagonist notes that the air outside is “not so great”; the sky is always orange; and Christmas hasn’t been celebrated in “years and years.” Viewers later learn there are plans to save Christmas, but that’s for another day. Taking students’ thinking to another level, expanding their horizons and giving them opportunities to express themselves are the goals of arts education, which Schefflin feels is “very important” in classrooms today. Over the last several years, Stages on the Sound has partnered with local Catholic schools to offer an in-school arts residency program with classes in filmmaking, playwriting and performance arts. The program is made possible through a generous grant from the diocesan St. Elizabeth Ann Seton Trust. Teaching artists are currently working with fourth-, sixth- and eighth-grade students in 37 Catholic elementary schools in Brooklyn and Queens. Justin Charneco is excited his fourth-grade class at Notre Dame Academy will learn to make animated movies on iPads in the coming weeks. “They’re going to teach us about how to create a film, a little film with editing and pictures and everything,” Charneco said.